The Sheward Partnership is excited to announce that Bridge, a residential project for which we were the LEED and Sustainability Consultant, was awarded an Award of Merit in the Sustainability category by the American Institute of Architects, New York Chapter. Bridge is a thoughtfully-appointed apartment building designed for modern living in the Old City neighborhood of Philadelphia, Pennsylvania. The building is comprised of 18 stories, 146 units, and retailers at street level. 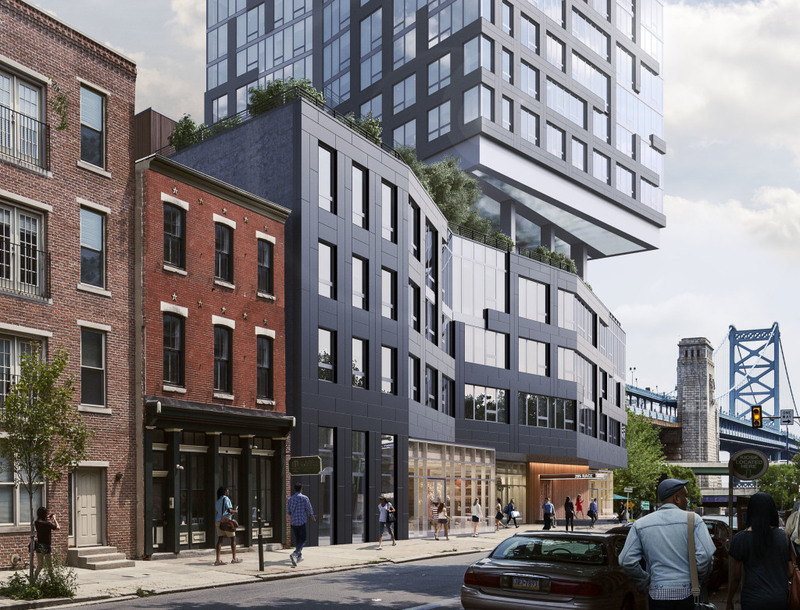 The innovative project combines the charm of Old City with modern design and amenities, tying classic aesthetics with considered, contemporary architecture. Rising above the adjacent Benjamin Franklin Bridge and overlooking historic neighborhood streets, Bridge provides exceptional views in every direction. Bridge is the first development of its kind in Philadelphia. 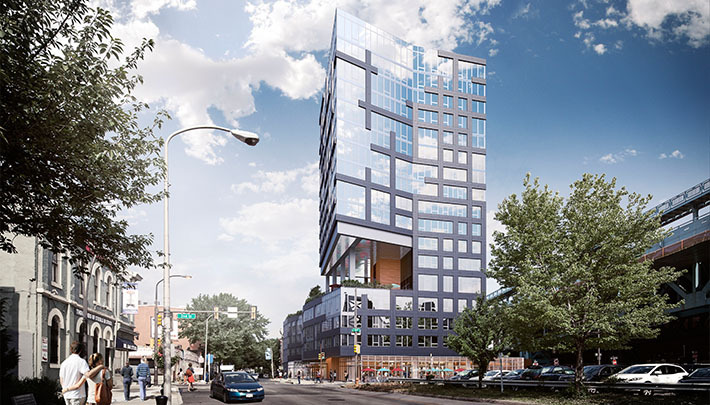 One of Philadelphia’s first high-rise LEED Gold apartment buildings, this facility incorporates sensitive architecture to its community and the inclusion of a diverse population through low-income units. Among other prestigious awards, Bridge was also awarded a Groundbreaker Award by Green Building United in 2018. The project was recognized for its leadership, innovation, and commitment to sustainability and the built environment. Bridge is surrounded by history, but it was built to achieve the highest standard in sustainable design. 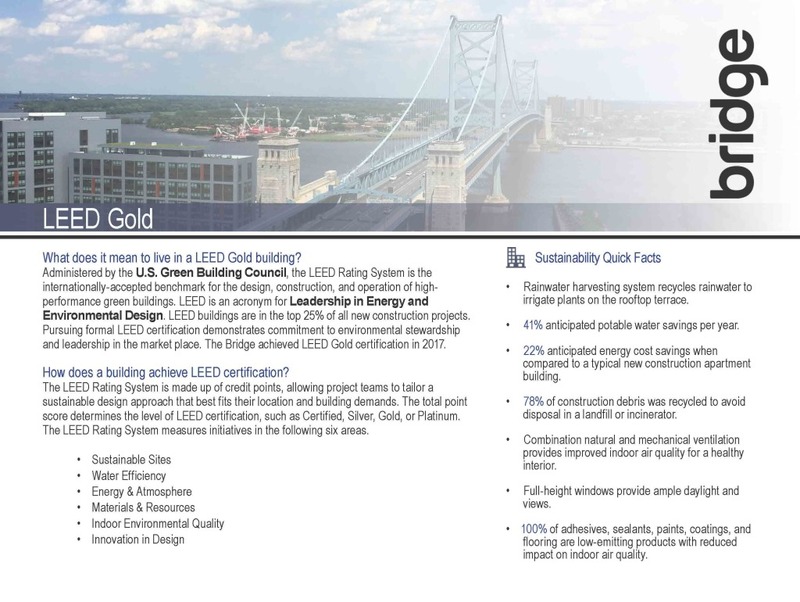 The building achieved LEED Gold certification under the LEED 2009 for New Construction Rating System in 2017. The Project Team utilized a holistic approach to sustainability. Early in design, the team established the overall goal to reduce consumption of energy, water, and natural resources, as well as promote the health and well-being of residents, visitors, and staff. The new building anticipates 22.9% energy cost savings through an innovative heating and cooling system called variable refrigerant flow technology. Other contributing energy efficiency strategies include a high-performance building envelope, LED lighting, and full-height windows for ample daylighting. Each unit is fit-out with low-flow plumbing fixtures, smart thermostats that are adjustable through residents’ smart phones, and individual energy meters to encourage energy and cost savings. Sustainably-minded amenities for tenants abound in their new home. Bridge is equipped with a stunning 8,000 square foot roof terrace, including vegetated roofing with seating amenities for occupants. The ground level features plantings, benches, and art installations to beautify the neighborhood. Health is of the utmost importance which is enforced through a no smoking policy and low-emitting building materials. The Building Owner provides ongoing sustainability education so residents can take advantage of the benefits in their LEED certified home. Street view of ground level retail tenants. From inception, the architectural design of the building was directly impacted by its neighbors. When concerns were voiced about blocked views of the skyline and water, the project team carved out a piece of the building and created a mirror-ceilinged terrace to allow pedestrians to see the beautiful landscaped terrace from the street level. Additionally the ground level features plantings, benches, and art installations to beautify the neighborhood. To activate the streetscape, first floor retail amenities include a restaurant, coffee shop, and beauty salon. The LEED certification process solidified the building’s commitment to local sustainability impact and, ultimately, a far more expansive impact. The strategies set a high precedent for other developments of its kind in the area. Bridge is a part of a growing population of apartment buildings in Philadelphia that have committed to a no smoking policy in the building and on site to ensure a healthy indoor environment. In construction, 21.3% of building materials were sourced within 500 miles of Philadelphia, which supports the regional economy. Another sustainability consideration with a tangible impact was the diversion of 81.6% of construction waste from disposal in a landfill or incinerator. For example, waste gypsum wallboard was ground into fertilizer and paper backing was reused to make animal bedding. The Bridge utilizes a comprehensive recycling program for its tenants and staff that collects paper, cardboard, glass, plastic and metal. To further reduce the amount of waste entering landfills, retail tenants compost food waste. 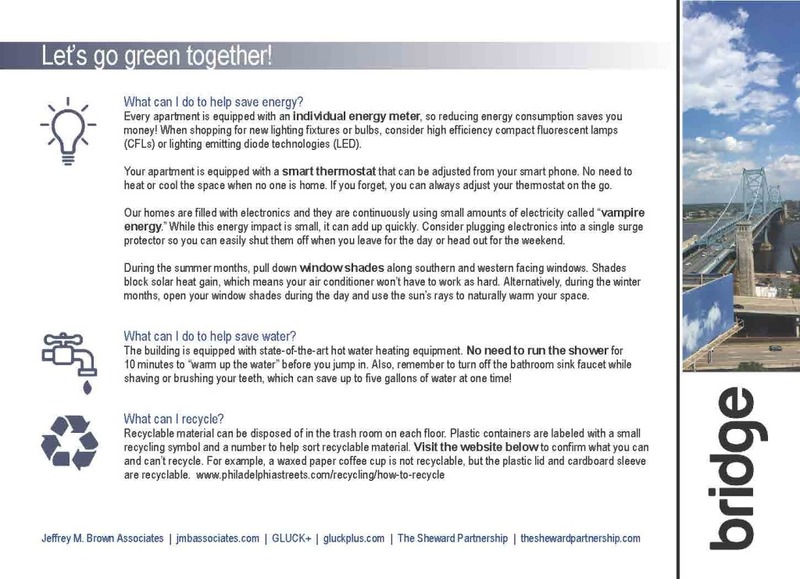 In order to solidify the building’s commitment to sustainability, The Sheward Partnership developed educational materials for tenants and staff to explain how to best live in and care for the new building. Green grounds maintenance, green cleaning, and waste management guidelines were established for building maintenance staff to follow. Additionally, the building owner scheduled community events to educate the tenants of the building on how to make the most out of their LEED Gold apartment building. The tenants learned about the sustainable components of their building, how it achieved LEED certification, and what they can do to help save energy, save water, and recycle correctly. With the help and dedication of its community, Bridge will continue to demonstrate commitment to environmental stewardship and leadership in the residential market place. The Sheward Partnership created a postcard for tenants to explain the sustainable features in their home. Structural Engineering: The Harman Group, Inc.
Civil Engineering: Cornerstone Consulting Engineers and Architectural, Inc.
Renderings courtesy of GLUCK+ and Volley Studio.